A tender for 94.5 USD/MWhel in Dubai and an R&D initiative called SunShot in the United States have shown how the cost of concentrated solar power (CSP) could be lowered at a steady pace thanks to economies of scale and optimised manufacturing and operation. Though the solar power market has been the driver for most of these developments, their outcomes are likewise relevant to solar thermal, where concentrating technologies have been used to provide heating or cooling for industrial processes. Two recent webinars organised by Spanish-based consultancy ATA Insights and focused on CSP in the MENA region and Chile had developers and researchers discuss the main drivers for cost cutting and the technology outlook in the short and medium term. 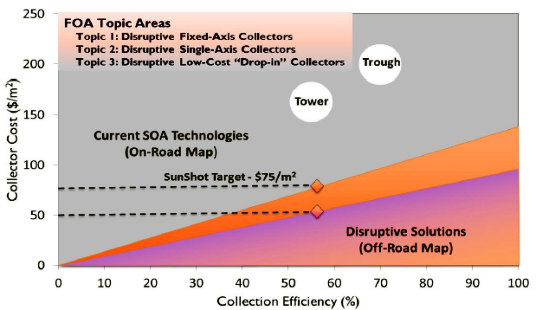 The chart illustrates the SunShot aim to bring down the cost of parabolic trough collectors from around 200 USD/m² to 75 USD/m². Regarding the recently launched invitation for a CSP plant in Dubai, tenders have been submitted and are currently being evaluated. Of course, details on the process have been scarce, as no tender has been selected as of June 2017, when the webinar took place. The plan is to get a 25-year contract for a 200 MW CSP plant equipped with an 18-hour thermal storage unit to provide power from 4 to 10 a.m. on 365 days a year. However, the most important part of the tender invitation has been the possible milestone in CSP cost reduction, as the lowest bid offers solar power at 94.5 USD/MWhel. Paddy Padmanathan, CEO of ACWA Power, the Saudi Arabian business which had submitted the record-breaking proposal, stated during the June webinar. What the 9.45 US$ cents CSP bid means to the MENA region that attaining these low figures had been the result of optimisation, improvements and more companies joining the supply chain and the possibility of a lower surcharge because of fewer risks and contingencies to plan for. Additionally, the current financial environment of low interest rates had played a role too, as CSP entailed considerable capital expenditure. A stunning revelation was that it should be possible to reduce CSP costs from 290 USD/MWhel in 2007 to around 100 USD/MWhel in 2017, after there had only been a global capacity of 5 GW by the end of 2016, with 110 MW added in 2016, as per the Global Status Report 2017. Dubai has an annual DNI (Direct Normal Irradiance) of about 2,000 kWh/m² and year, whereas the DNI in Chile’s Atacama Desert is about 3,000, leaving room for additional cost cutting. Overall, the webinar speakers agreed on a cost forecast of 60 to 100 USD/MWhel by 2022, except for Jenny Chase, Head of Solar Insight at US-based consultancy Bloomberg New Energy Finance, who seemed more sceptical about Dubai and predicted above 100 USD/MWhel. Accounting for the 30 % power production efficiency, one can expect CSP systems focused on heat to produce thermal energy for 20 to 33 USD/MWhth. Andru Prescod, Technology Development Manager of SunShot at the US Department of Energy, showed during the May webinar Objective: CSP at US$50MWh by 2025 how competitive R&D funding can drive down the cost of CSP. The LCOE (Levelised Cost of Electricity) of CSP dropped from 210 USD/MWhel in 2010 to 120 USD/MWhel in 2015. Even more striking, the above-mentioned SunShot target would mean a 2020 price of 60 USD/MWhel and imply solar field costs to be below 75 USD per m² of installed mirror area. Prescod said that reduced solar collector prices were mainly the result of higher production volumes and more efficient manufacturing and business processes. An interesting development in this context is the Department of Energy’s Green Parabolic Trough Collector project, where an alternative material – much less expensive than steel – is used and a price of below 50 USD/m² is expected by 2020. Similar targets had been set in Chile, as highlighted by Angel Fernández from the Universidad de Antofagasta and Chile’s Solar Energy Research Centre during the same webinar. By 2025, the LCOE should be at 50/MWh, with a solar field share at around 13 USD/MWhel. There is a free tool available to calculate the latest CSP cost figures. It is called System Advisor Model, or SAM for short, and was developed by the US National Renewable Energy Laboratory as a performance and financial model to facilitate decision-making for renewable energy stakeholders. SAM data is collected during a survey among CSP stakeholders and developers and is shown in separate sections on power tower systems and parabolic trough versions.